We do all sorts at S2C. Some of it is very much obvious and out there and other things are far more subtle. Sometimes the subtle things that may go unnoticed are the ones that have the biggest impact. I hope, and indeed observe, that the community spirit we have builds trust. Trust is important when you are dealing with the vulnerable because when you feel vulnerable then it is very hard to trust. The reason I touch on the subject of trust is because over the last five or six months there have been a number of occasions when vulnerable individuals have trusted us (those of us at S2C who take on the role of being the “go to” people) to disclose issues. None of these have been minor issues but massive life changing and threatening issues. Sometimes it is enough that you listen. You could well be the first person they have told about the issue and the fact that they trust you enough to disclose and you listen to them can be the catalyst for them to then go and seek help from an appropriate source. Sometimes this might be a call for help because they don’t know where else to turn and along with listening there is the opportunity to help the individual by putting them in touch with someone who can help them or referring them on to another service. At this point I have to sing the praises of the Gateway e-hub. This is a collective of local charities and services that hold an online system of information about service with the ability to refer service users to each other. Age Concern have developed the system and it grows in the local area as more organisations and groups take it on. I come to the main slant of this blog however. This is one area where on an individual disclosing to us we are left powerless other than to be there and be supportive. I am talking about suicide. On a number of occasions we have had disclosures of suicidal thoughts or a concern about an an individual close to somebody. The problem I personally have with this is one of willingness to engage with services. It is very humbling that a person trusts you enough to talk about this very difficult subject but the problem arises where that trust does not exist with other services. So, for example, an individual discloses they are suicidal. This is not always an easy thing to spot. I know from personal experience. When, many years ago now, I was suicidal I didn’t tell anyone. I wasn’t using it as a threat or to get attention (popular misconseptions and assumptions unfortunately) and in fact was very secretative and almost plotting the moment when I would try and kill myself. So that somebody trusts you enough to tell you this is a major major important moment. Why do I have difficulty with this. Certainly not with the act of disclosure. I am very willing and prepared to support somebody with those feelings. My difficulty lies with what to do next. If that person is hiding their intentions and does not want to get help from anyone. If they will not engage then it is very difficult to help them no matter how much trust is there. I survived one of my suicide attempts because a person I trusted came before I hit the coma I went into. Anybody else I may not have opened the door to. They got help and I was unconciouse in hospital for three days. Had I not let them in or they had come a little later………trust is important. Faced with a situation where the individual does not want to engage you can call but often get told a referral from a GP is needed before any action can be taken. A crisis team may visit them but again the failure to engage or present any signs of suicidal intent might not be there. That person can then go on to deteriorate or attempt suicide and the only option you or the concerned person might have is to call the police. I hear this kind of story, usually from relatives of individuals threatening suicide, where they have felt the only option is to call the police after trying to get help from anyone else. It is a tough one to deal with. Trust. The person trusts you. It is a big responsibility and you can only try and use that trust to get them help. However small a first step is then to use that trust to get the individual to do something positive. One small step can be the catalyst to getting the help they need. That trust comes from being there and listening to them. At S2C we don’t set out to build trust just for this purpose. Trust is an essential part of any community but if everyone in the community knows everyone else will listen then there is hope that problems can be solved. Yes, another exhibition, but this one is just that bit more special. S2C Summer Exhibition opens today (Saturday 19th August) 1pm till 4pm with refreshments. This is an exhibition that is focused on just the people who use S2C. The Service Users, the volunteers, the groups that use our space, everyone who is producing some kind of creative output is represented. Putting this exhibition up has been a privilege for me. A privilege because I have an intimate involvement with each piece of artwork. In selecting an artwork it speaks to me massively not just because of any artistic merit or technique used but because each piece has a story to tell to those of us who know. You are framing a work that you know was done by a particular person and you are thinking “Oh yes, they did this when they were released from hospital, they were really upset at the start but they left laughing”. Another piece is selected and it fill you with sadness because the person who created it unfortunately passed away after a short illness. The next one you pick up is somebody who no longer attends S2C because they have recovered to the point where they have managed to go and find themselves a job so that picture reminds me of the journey they were on from first coming to S2C to the present. Of course when you visit the exhibition you will not know any of this. There are clues in the snippets we have added around the exhibition from our serive users but the actual individual stories will not be there for you the viewer. However, as you look at the exhibition you can be aware that everything there is part of a journey for somebody. It will have started in crisis, it may have been created in turmoil or in recovery. It will have a story which you can only possibly imagine. But that is the same for artwork often in any gallery you go to. You stand in front and you can only imagine what the artists motivation was. There are clues with us as you know the circumstances. So this exhibition is there to represent the community that is Space2Create. That encompasses the service users and volunteers, the visitors and those that use the space. All leave there mark there, in artwork, in cleaning, in creating the environment and the ethos. 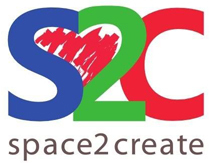 The Space2Create community invites you to take a look and think about the multiple journeys represented in that exhibition. Not a philosophical question about human existence but a consideration of who S2C is for. I was filling in some funding applications recently (a hobby of mine) and of course they all want to know how many people the project will help and what group/section/illness etc your project will support. This is a really important thing to clarify because the majority of funders I have criteria by which they grant funds. There is no point applying for a grant from a funder who’s focus is under 18’s with low self esteem in Brighton when doing a project to boost self esteem in the over 50’s in Kendal. So this started me thinking about who S2C is actually for. A difficult question. Difficult because the people who come to us have many common reasons but also very differing reasons at the same time. So then I started to think of the individuals who had been in the past or were coming to sessions now. Why did they need S2C and what did we give them? We have mainly been associated with mental health but over our existence have shifted into wellbeing. The terms, I feel are very different, though both relate to the state of your mind. I always feel wellbeing is a more rounded and whole person thing where mental health relates more to specific conditions though good mental health is important to wellbeing, equally good physical health is too, friendship, feeling useful, having purpose, good housing, relationships……..it goes on. So we have a lot of people with a variety of mental health issues ranging from bipolar, schizophrenic, depression, self harming and many others. We don’t deal directly with those conditions but rather support people through them. There are four points we may see somebody with a mental health issue. Firstly when they are, for want of a better expression, on the way down. Attending S2C might help them reduce the effects of their condition, making sure they are at least not alone and are distracted for some of the time. It’s possible that the severity of a condition might be lessened. Secondly when that person is being treated for a condition. This might be while being supported by a CPN or support worker or when they are on the psychiatric ward. Again it’s that safe place to go and be supported in a positive environment helping people get through difficult times. On the ward we again offer that distraction and positive input. Thirdly on the way back up into recovery. We are there to help people rebuild social skills, confidence esteem and a positive outlook. Having focused on mental health a lot of physical conditions can have similar isolating, confidence lowering effects as a mental health condition. We have individuals who have come to us with a range of physical illness, disability or conditions that have left them in need to of the same safe place, friendship and community. Then of course there are people who have been isolated by circumstances. divorce, redundancy, those things that happen in life that leave people a little lost and maybe reduced confidence. They might be caring for somebody. There is of course no reason why any person can’t come along and join in from a purely art motivated point of view. Finding the time and inspiration to create can be difficult sometimes. It can be that attending sessions gives that motivation and inspiration needed to be creative. Reading that back it barely scratches the surface. Yet there are common themes regardless of the cause of self esteem, self confidence, loneliness, isolation, low wellbeing, social exclusion, insecurity, poor motivation, lack of opportunity……….. So that is where we sit. ready to welcome those people in and do our best to make sure that they leave a little better than when they walked in. Can I ‘av a word…………. It is only when you talk to individuals you are helping at a place like S2C you realise how it is you’re helping them. We have these grand theories about the benefits of creativity and indeed I strongly believe that creativity plays a big role in supporting an individuals recovery from crisis. However, the nitty gritty, what the creativity facilitates, the actual nuts and bolts of it is a little harder to get to. Then sometimes somebody does a session where those inner thoughts and benefits get tapped into and you get a valuable insight into what it is your doing right. That happened this week with a visit by Shaun who is making some promotional films for S2C. Because many of our service users do not want their face shown in images and films Shaun was planning to do a number of animations and activities that allowed the people in a session to express themselves without doing so to camera. We set up an activity where the group were asked to think of a word that described how they felt or why they came to sessions. Shaun then created a time lapse of all these words being applied to a large piece of paper on the wall. I was very curious to go round during the session and gently enquire as to why they had chosen that word. Support: not the official kind but support in terms of how people support your ideas and allow you to express yourself. You can do something and you get positive support that encourages you and validates what you are doing. Peace: not about the noise level but how you feel about yourself. Alone at home you can feel in turmoil but coming to S2C and being among the people who know what it is like and treat you with respect gives a real sense of inner peace for a time. Comfort: the comfort of knowing you are not alone, when you are struggling having a safe place to go where nobody judges you and people respect you. Not alone: just being with other people, together and doing an activity, talking. Away from that you can feel so very alone even with other people, but you don’t feel alone here (S2C) because everyone understands. Permission: having permission to express yourself without fear of being put down or ignored. People: just being with other people, sometimes you feel alone and lonely but it’s nice to be in the group and part of the group. Friendship: as soon as you come to S2C you a treated like you have been coming forever and you get the chance to meet and talk to people who become your friends. Art: Being able to do the art I want to do and not do the art other people tell met to. Calm: Feeling calm instead of in a panic or anxious because you know there is no right or wrong here, what you are doing is valued no matter what and the moments when everyone is creating where a hush descends and a very serene calmness fills the room is amazing. Laugh: we can laugh and do laugh a lot. It sounds odd but it feels safe to laugh. Creativity is the pot, the people are the ingredients, the session leaders the spoon that stirs it together and it all turns out fine.